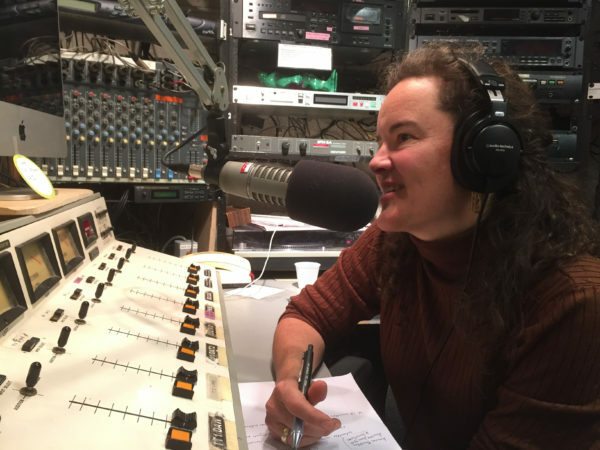 Using Radio to Build Hope: Portland Psychiatrist hosts Safe Space Radio to foster empathy and understanding. March 29, 2017 (Portland ME) Safe Space Radio is proud to announce that its most recent one-hour documentary, “Still Here: Caregiving and Dementia” has been awarded a prestigious national Gracies Award for outstanding host/anchor of a local public radio show. The Gracie Awards recognize exemplary programming created by women, for women and about women in all facets of media and entertainment, as well as acknowledge the individuals who have made inspirational contributions to the industry. Dr. Hallward was inspired to make this program after watching her mother care for her father during the 16 years of his dementia. She observed firsthand the way that the increased responsibilities of feeding and bathing a loved one are complicated by isolation and grief. She wanted to create a program that gave voice to the often silenced aspects of this experience that can leave caregivers feeling alone with really difficult feelings. Dr. Hallward is tremendously grateful to the Hope and Grace Fund, for their enthusiasm for the mission of Safe Space Radio and the generous grant which made the project possible (http://hopeandgracecommunity.com/about/). The mission of Safe Space Radio is to inspire courageous conversations, break down the barriers that divide us, and create compassionate communities. By broadcasting courageous conversations about difficult topics, such as depression, anxiety, dementia, and PTSD, the show seeks to reduce the public health problem of stigma and shame by fostering compassion and hope. Safe Space Radio has been airing weekly on Portland’s own WMPG for over 8 years. This year the show produced two documentaries that aired on stations across the country from Alaska to Arkansas. The organization is gearing up to nationally syndicate a new hour-long version of the show that is filled with stories about hidden subjects in honest, funny and transformative ways. The show will contribute to a culture of health by compassionately shedding light on difficult subjects to foster understanding, build community and offer hope. Dr. Hallward will join other award recipients at the Gracies Luncheon celebration on June 27 in New York City.